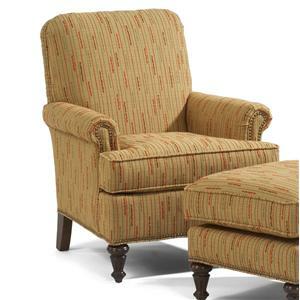 The Flemington Chair is a great accent piece in your home. It has a traditional style that will look nicely in any home's interior. Features include an attached back and reversible seat in a luxury cushion. Rolled arms are highlighted by decorative nail head trim to add a beautiful detail to this chair. The turned and exposed wood legs add the finishing touch to this chair. Available in both fabric and leather. The Accents Flemington Chair by Flexsteel is available in the area from furnishingretailers.com.